At the very end of last week’s episode of The Walking Dead, “Inmates,” the hit zombie drama gave us our first onscreen look at some highly-anticipated new characters. Fans of Robert Kirkman’s comics have been waiting for the arrival of Rosita Espinosa (Christian Serratos), Abraham Ford (Michael Cudlitz), and Eugene Porter (Josh McDermitt) since we first heard they were on their way. 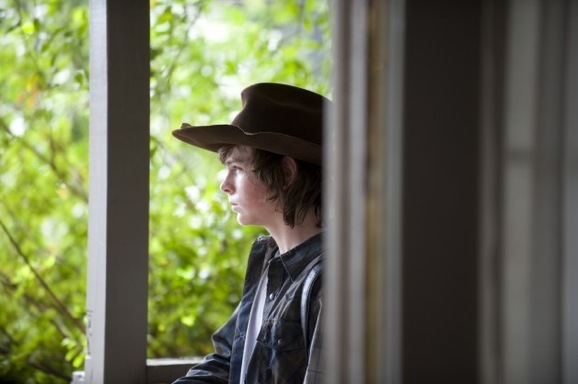 In anticipation of tomorrow’s episode, “Claimed,” AMC has released some new photos. The other day we got our first good look at Rosita, and these pics give us a closer look at McDermitt’s Eugene, as well as some other, more familiar folks. “Inmates” doesn’t do much aside from show us the new additions, but this week promises to give us a proper introduction. 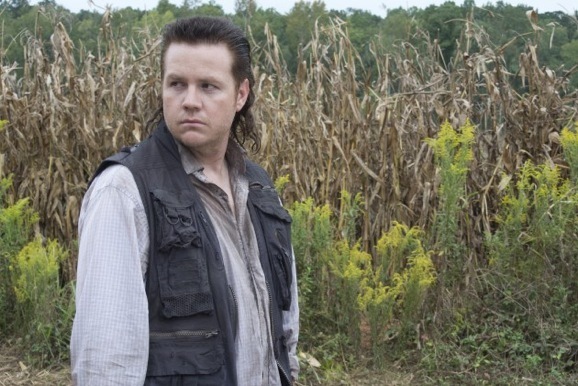 Eugene may have gross, greasy mullet, but that rough exterior hides something much deeper and more cunning. I won’t go into the details from the comics, but, if the show sticks close to the source material, he should be an interesting character to watch. In any way, all three will have a huge impact on the narrative moving forward. 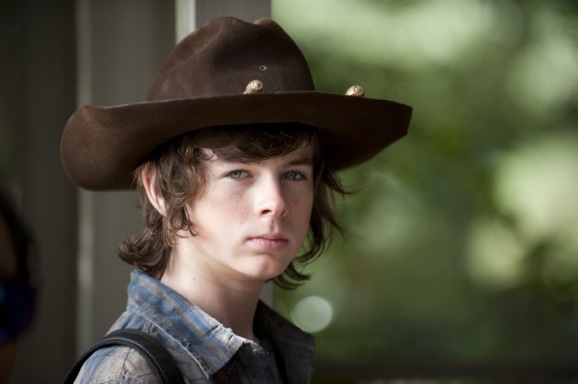 There’s an obligatory photograph of one of The Walking Dead’s walkers—there’s at least one in every set of pictures they release—but the rest focus on Carl (Chandler Riggs) and Michonne (Danai Gurira). 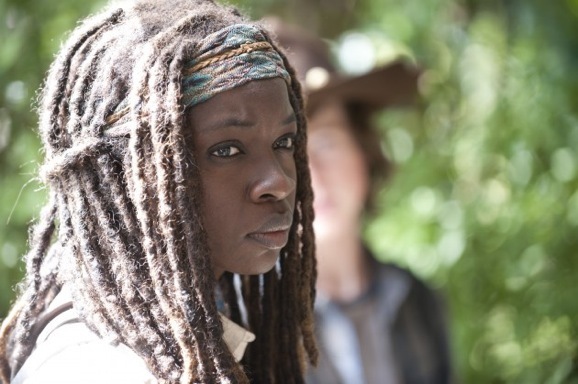 At the end of the first episode back from the midseason hiatus, “After,” Michonne finds the house where Carl and his father Rick (Andrew Lincoln) are hiding out, and has a rather emotional reaction. These stills show a different side of both of these two. Instead of their usual scowls and grim countenances, they both look damn near peaceful, at least more peaceful than usual, almost like they’ve settled into a quiet domestic routine. 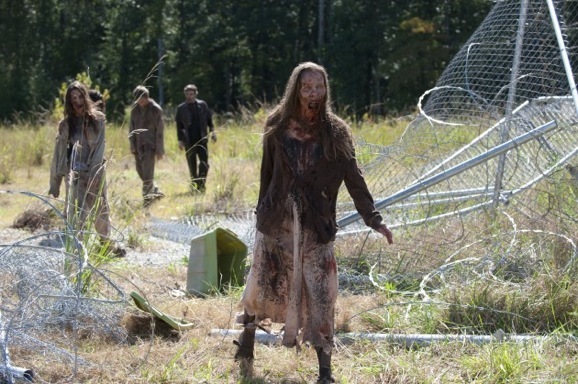 Given the severity of the injuries Rick sustained at the prison—he spent most of “After” in a comatose state—they could use a break to let him heal. 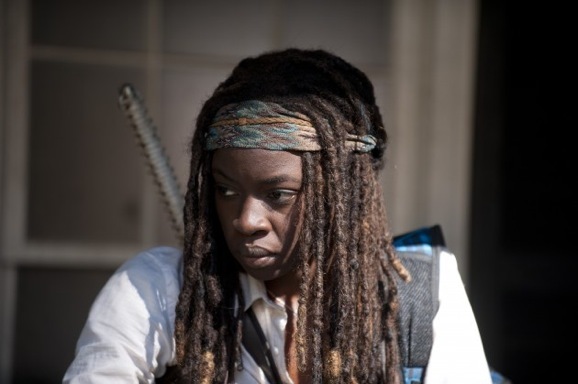 Michonne still has her trademark sword slung over her back, but something about the expression on her face, coupled with a crisp white button down shirt that is a stark contrast to her usual wardrobe, smoothes over the rough edges. Going back to that Rosita picture for a moment, I have some issues with her fashion choices. I know they’re in Georgia—somehow in all their travels, they’ve seemingly never set foot outside of the Peach State—and it’s hotter than hell. I get that, but I have to say, half shirts and short shorts seem to be a poor choice considering that there are flesh-starved creatures out there trying to eat you. Even a slight puncture wound will turn you into one of them, so you’d think more layers, thus more protection, would be a bonus. But what do I know.